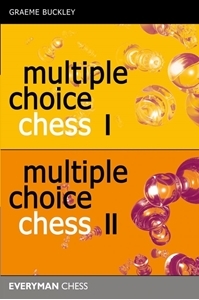 Together in one volume for the first time are Graeme Buckley’s Multiple Choice Chess and Multiple Choice Chess Volume Two. Are you realising your chess potential? Multiple Choice Chess International Master Graeme Buckley helps you to find out. Through a series of instructive games where you must work out the next move and the tactics and strategies surrounding it, you can assess your own chess strength. In his second volume, Buckley repeatedly poses the question 'What would you do here?' The reader is invited to step into a grandmaster's shoes, work out all the relevant tactics and strategies of the game and select a move out of a possible four choices. A scoring system has been devised which can assess your playing strength according to the answers you give. It's as simple as that!